I can be really lazy in some things. Witness the decoration on the front door. 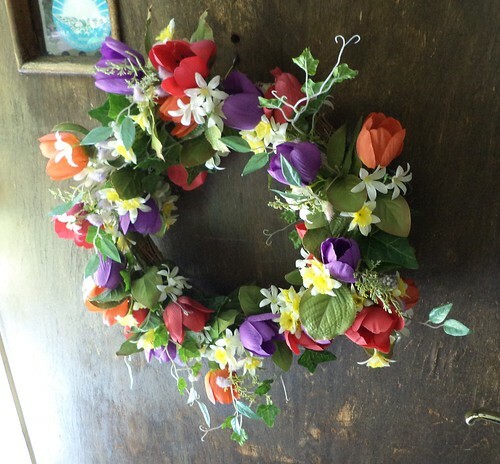 It's a lovely spring wreath. It's been hanging on the door since April. Now, all the times I go into the basement, I never thought to pull one of the more seasonal door decorations off the stack and put that on the front door. I just left the spring wreath. 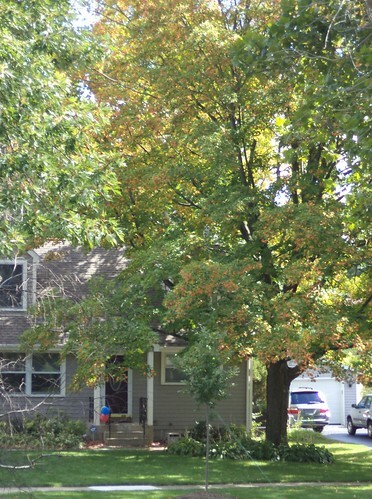 But, in the past 3 days, the maple tree across the street has started to turn. It was still solid green last Sunday. The changes in light are telling the leaves that fall is here and it's time to put on the fancy duds. I expect, by Wednesday, this will be ablaze in color. So, maybe, just maybe I should consider changing the front door decoration to something without tulips and daffodils. It is officially fall here.